Click here for my serendipitous fotos of WLV-612 under way a few months back. I traded those fotos for a tour. But the vessel immediately below is not 612 . . . it’s LV-87, 43 years older than the 612. Check out the riveted hull. Here and here are some previous posts on that Ambrose showing vintage in situ views and high and dry ones at Caddell’s last spring. 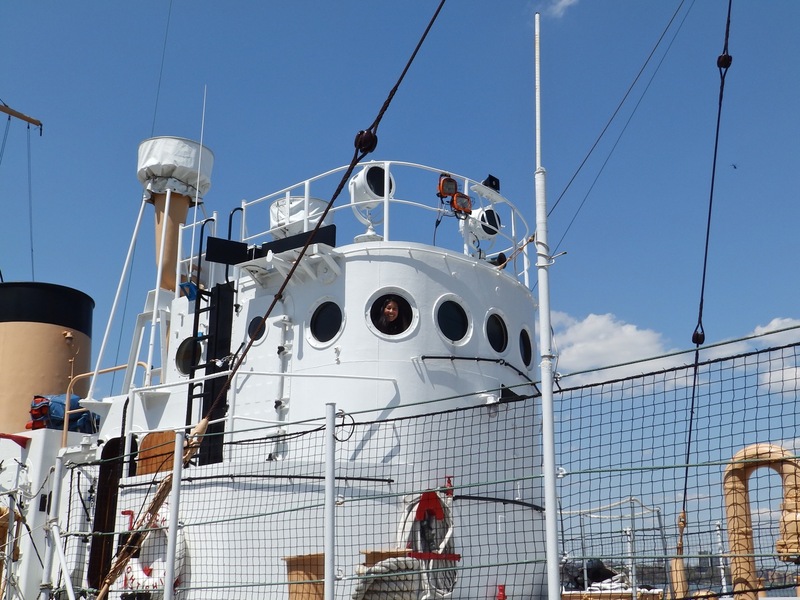 In comparison, here’s the bow of the 1950 Nantucket aka WLV-612. 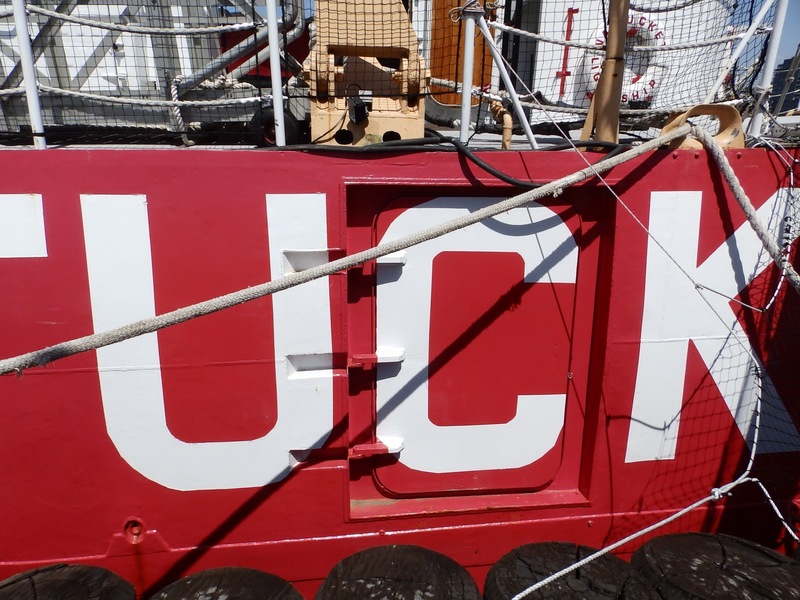 The C covers a hatch which when swung outward is marked with a U so that from a distance, one would still read the name on side as Nantucket. I’m not kidding. 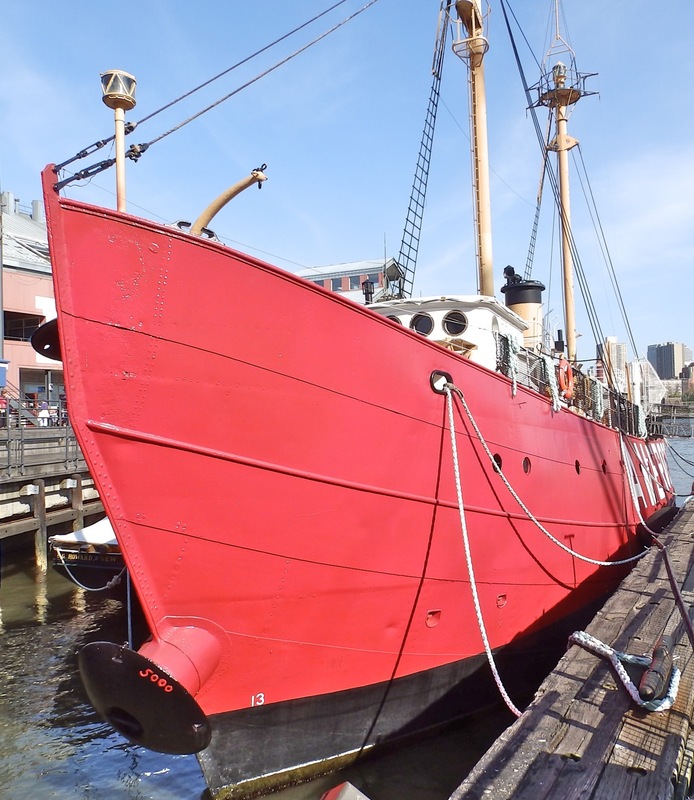 This is what a welded lightship stern looks like. But where is Nan, with whom I had the appointment to view the vessel? Spirals still lead between decks, although I’m guessing that everything about this vessel has been redone to yacht standards. For the official site fotos of what’s below decks, click here. 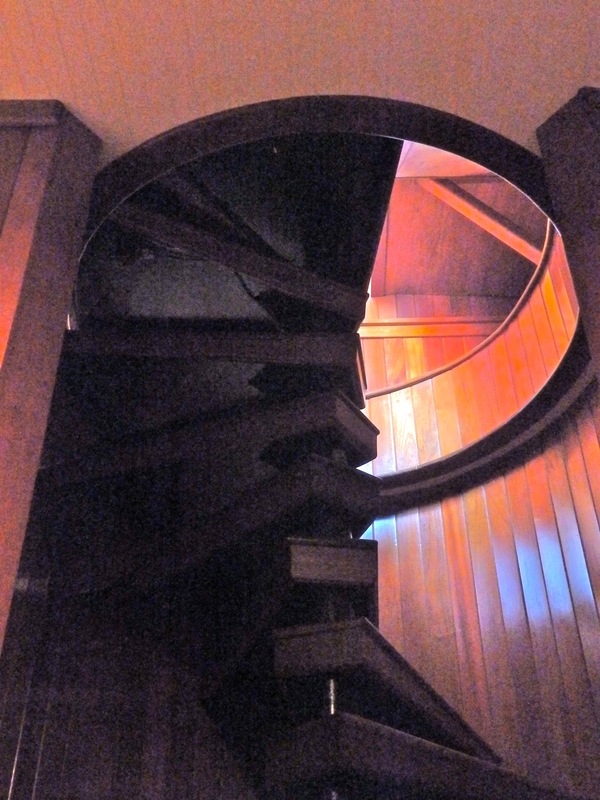 There are many more fotos on this listing . . for less than $7 m it can be yours. It will probably leave the sixth boro before the end of this month. Prominently framed below, the builder’s plate. But how did WAL become WLV? Addendum #2 Here’s the answer. 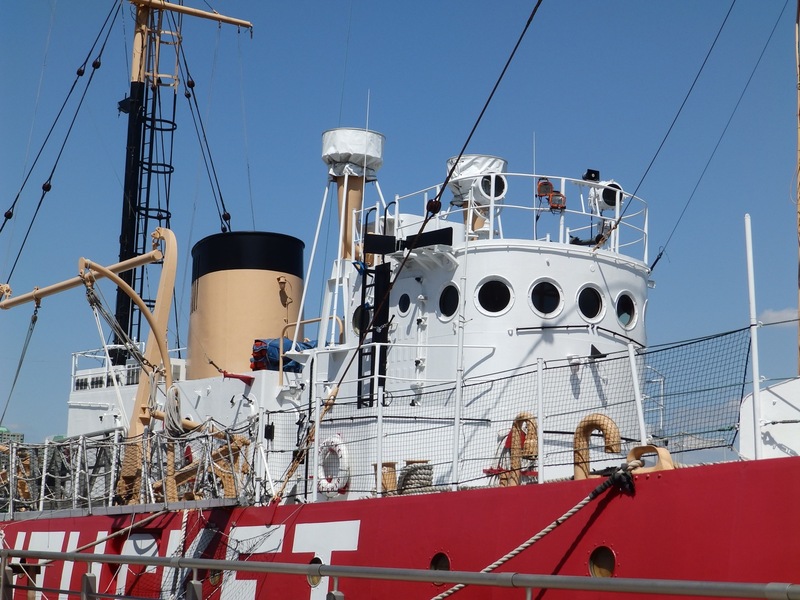 This vessel was the USCG last working lightship until 1983, and it did “other tasks” until being decommissioned in March 1985. 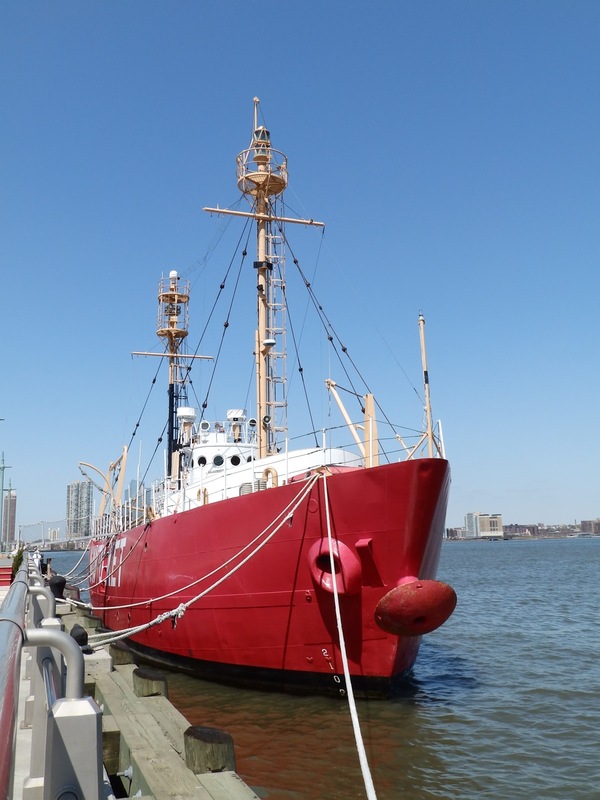 For a PDF on many US lightships, click here. Two of them are abandoned on a riverbank in Suriname. 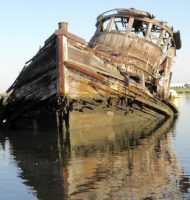 For some haunting fotos of a similar 1910 Dutch lightship (Lichtschip Suriname-Rivier) along that same river, click here. It seems there is a restoration project underway, as filmed here in the past month . . . but in Dutch. Basically, the narrator says “don’t fall through the deck, vessel came here in 1911, here’s the washroom, the kitchen, the anchor machinery, the light tower . 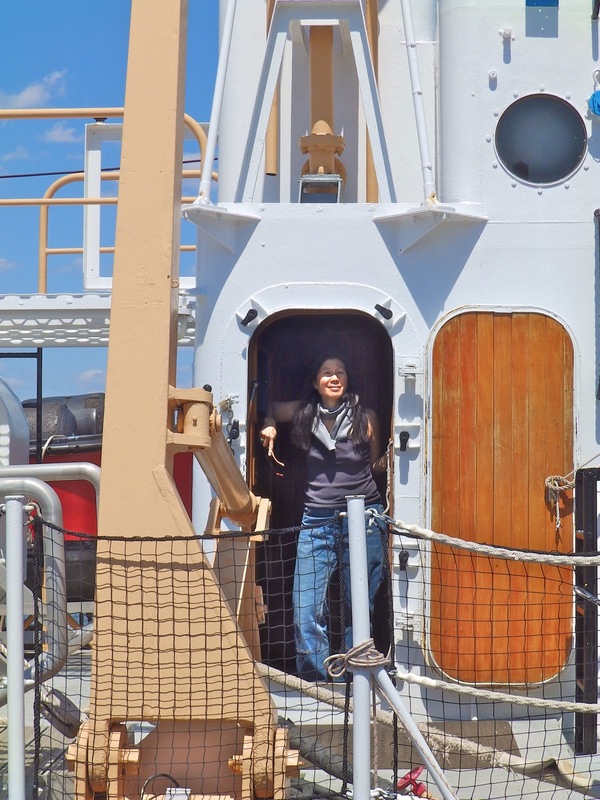 . . here’s the companionway heading below, yes . . . there’s water down there but we’re hoping to get her dry.” Come back when the job is done; meanwhile I am NOT going down below where some nasty critters might have settled in. I was in the USCG in the 1980s. 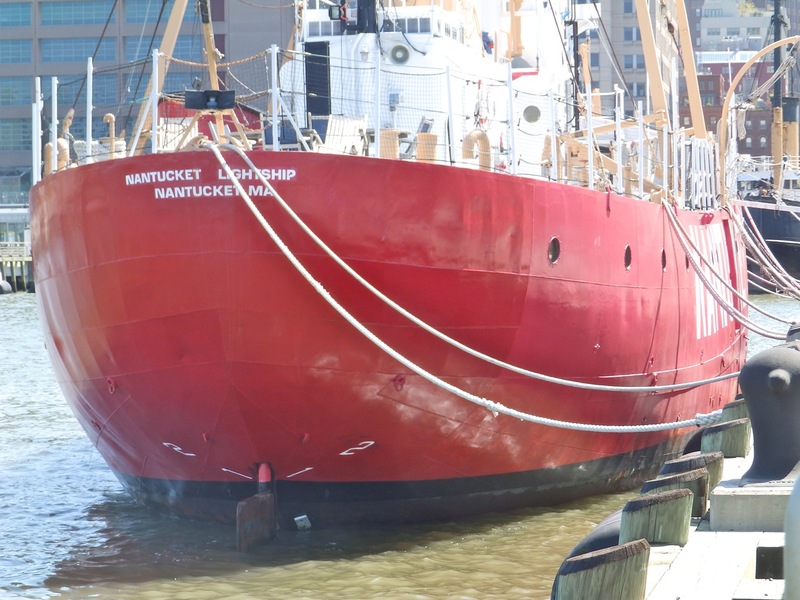 The Lightship was tested as a platform to coordinate vice president’s Bush security detail around Kennebunkport, ME. It was found that it wasn’t suitable. She then set out on a District 7 drug interdiction patrol in white with red stripe paint. She was then decommissioned. The US Coast Guardman’s manual shows a picture of a seaman at her helm. He later became an Electronics Technician and I served with him on Tamaroa before he was discharged. fast freddie- thanks. i’d love to see a foto of her in white with the red stripe . 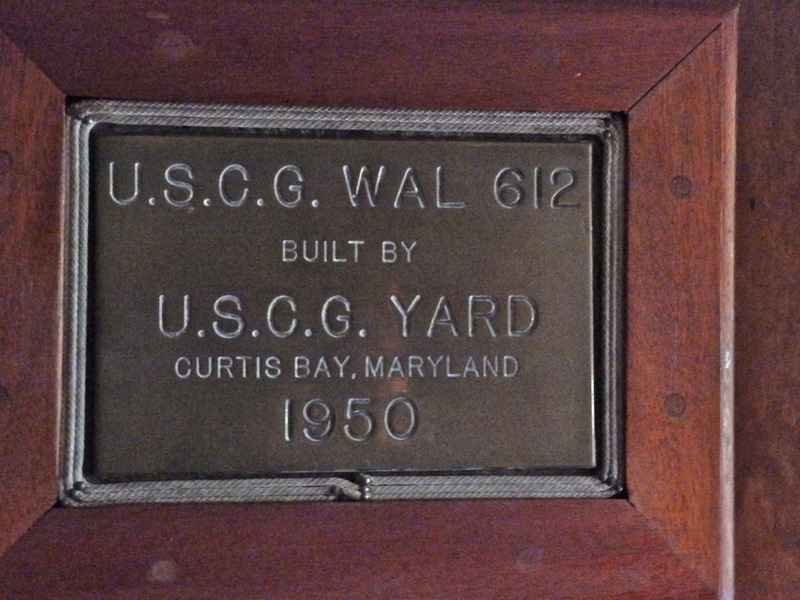 . . and quick search and a realization that the builder’s plate said WAL, led me to this ” Nantucket Lightship WAL 612: (Information provided by Rick Bennett former LSA Secretary ): 1984 Sept 26 1984 to Feb 2 1985 did the law enforcement patrol in Florida. During that time she RESCUED on SES surface effect ship from being seized by Cuban nationals by finding and taking the ship into tow just a short distance from crossing into Cuban waters. Relieved of tow just outside Miami harbor. I remember the dates of the ship sailing to Florida because my anniversary is Sept 25 we left the next day, and we sailed 7 days to return home, arriving in Boston February 9 1985 my wife’s Birthday. During the time that she was doing law enforcement on the northern east coast, we were assigned as a radar platform for Vice President Bush when he was residing in his home, and he joined us for a visit on the same day that Korean airline 007 was shot out of the air by the Russians, because he got called BACK to Washington while standing in the crews forward berthing of the 612. His one and only comment as he left f – – – – – – Russians”.